The courcy property has 393 claims covering an area of 199.3 km², located less than 100 km west of Fermont, Quebec. Stelmine holds 100% of the rights. The Courcy property produced several gold discoveries in a new mining district located on the eastern part of the Opinaca metasedimentary basin, The basin presents a high potential for the discovery of gold deposits in a similar geological contexts to that of the Éléonore Mine. Systematic structural and geological mapping of the property enabled the identification of a major (meta-) sedimentary basin containing greywackes, mudstones, quartzic arenites and monogenic/polygenic conglomerates interlayerd with amphibolites. It is presumed the basin is part of the Opinac sub-province instead of the Opatica. A major thrust fault marks the contact between the Courcy Formation and the metasedimentary basin. Photos (A) et (B): Banded Iron Formations (BIF) cropping at the Courcy 2.4 showing: Interlaying of dark (garnet and pyrrhotite) with light layers (quartz, plagioclase and amphibole). 111 grab samples collected principally from the Soulard Formation near the Couteau fault were analyzed for gold. Stelmine build-up a 3D model illustrating the various rock assemblages and geological formations composing the Courcy property (Figures 1, 2). The model was constructed by integrating the geological and structural data and the interpretation of the geophysical surveys. Figure 1 illustrates the presence of a large, strongly deformed (meta-) sedimentary basin composed of greywackes, mudstones, arenites, quartzites monogenic/polygenic conglomerates interlayered with amphibolites. To the south, a series of tonalitic, granodioritic and monzogranitic rocks belonging to the Atticoupi Suite define the contact with the metasedimentary and metavolcanic rocks. The Couteau fault is a major thrust fault extending 21 km and carrying gold mineralization. At the core of the property, the fault subdivides the Soulard Formation into two volcanic sub-units crosscutting iron-rich garnet and sulphide-bearing amphibolites and silicate-facies iron formations. The 3D model shows the best gold assay results located principally within the upper Soulard Formation along or near the Couteau fault. The 8 drill holes completed by SOQUEM in 2006 are presented on the 3D map (Figures 1, 2). The short drill holes are westward-dipping and appear to intersect the Couteau fault. 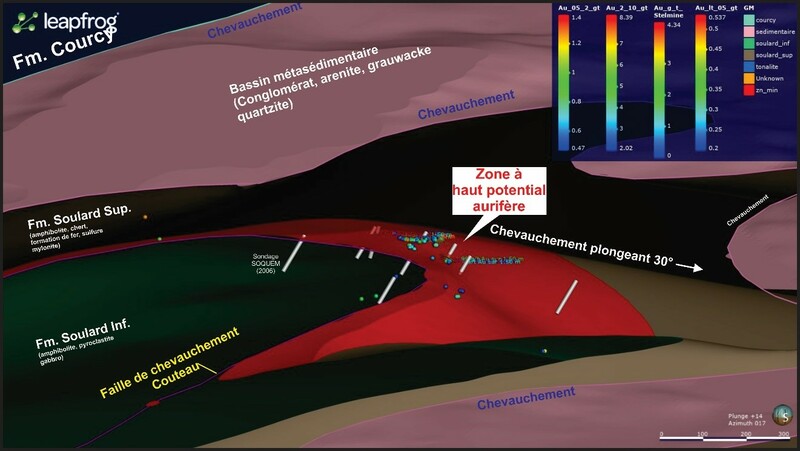 In fact, it is on or near the Couteau fault where the best gold intervals provided by two of the eight SOQUEM drill holes were found at the Courcy 2.4 showing (i.e. : 4.27 g/t Au on 42 m (including 12.15 g/t Au on 13.5 m); DDH no. 8 and 0.94 g/t Au on 10.50 m, DDH no. 4). This well-exposed showing underwent extensive work underlined by channel sampling by Stelmine. 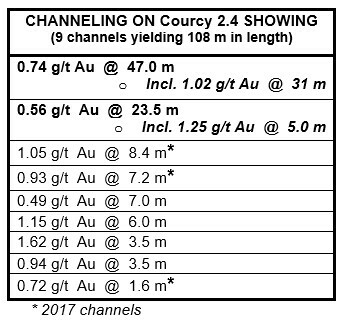 One 47-m channel recently yielded excellent gold values which are presented below with the data provided by other channel samples. Stelmine expects to receive shortly the results of the remaining samples analyzed at the Actlabs laboratory. The 3D model indicates the Couteau fault was associated with a first deformation event and, conjointly with the two other thrust faults limiting the contact with other rock assemblages, was refolded during a second deformation episode generating ENE-folds dipping moderately toward the east (Figure 1). The general view of the property shows the Couteau thrust fault defining the gold-mineralized contact between the Lower and Upper Soulard volcanic formation along with the zone of highest gold potential. The Soulard Formation is mainly composed of amphibolites (metabasalts), occasionally pillowed, of intermediate tuffs, cherts/quartzites and of iron formations. The gold mineralization infiltrates the Couteau fault and adjacent units on a 5 to 20-m estimated thickness in structural traps (fold hinges, strongly folded and mylonitized zones). It is contained within highly deformed and metamorphosed layers rich in semi-massive to massive sulphides associated with garnet porphyroblasts, quartz, plagioclase, hornblende and pyroxene. 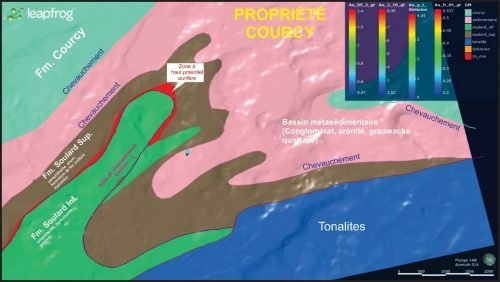 Stelmine geologists have identified the Couteau fault on several stripped outcrops at the core of a large antiform exposed near lac Couteau principally at the site of a fold hinge at the Courcy site. A Close-up view of the principal gold-mineralized zone at Courcy (Figure 2) displays the eastward- plunging Couteau thrust fault. and zone of highest gold potential following the contact between the Lower and Upper Soulard Formation. 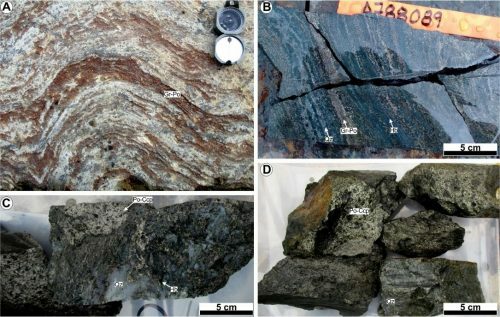 The localization of surface mineralized samples collected during the 2017 exploration campaign are on or near the trace of the fault principally within the Upper Soulard Formation. The occurrence of the folded Couteau fault produced during a second deformation event generating structural traps, its association with sulphide-rich and auriferous iron-rich metavolcanic/iron formations and its extension on 21 km strengthen Stelmine confidence in the potential of the Courcy property and encourage the Company to pursue the exploration work. The Courcy gold property is located in the eastern portion of the Opinaca Sub-province near the Quebec/Labrador boundary. A total of 751 rock samples, including 433 channel samples having a total length of 398 m were collected from outcrops, ancient and new stripped zones. Theses samples were sent for Au and other metal analysis to the ALS Chemex Laboratories in Val d’Or. In 2006, SOQUEM conducted a sampling campaign involving eight (8) short bore holes which intersected lithologies containing significant amount of gold. Best gold intersection from one hole is 4,5 g/t Au over 42 m including 12g/t Au over 13,5m. Over 30 gold-rich showings were identified without subsequent verification by drilling. (Press release December 14, 2016). Stelmine also reinterpreted previous airborne and ground-based geophysical surveys (i.e. Mag, VTEM, TDEM, Max-Min). Rock samples were sent to IOS Services Géoscientifiques for thin section examination and rock samples were forwarded to ALS Chemex for whole rock and trace element analyses. The geophysic map drawn through the re-processing and interpretation of the past data filed by SOQUEM show a clear distinction in apparent resistivity, whereas the Soulard Formation containing the Au-mineralized BIFs is characterized by very low apparent resistivity relative to the Courcy Formation and plutonic rocks. This testifies of the sedimentary mature of the Soulard Formation. The latter show strong conductivities and the calculated Tau (dB/dt) values from the VTEM survey display relatively high thickness of sulphide-bearing rocks, mostly associated to BIFs, not only west of Lake Couteau, but to the less investigated northeast and southwest regions, opening new possibilities for exploration (Figure 6).